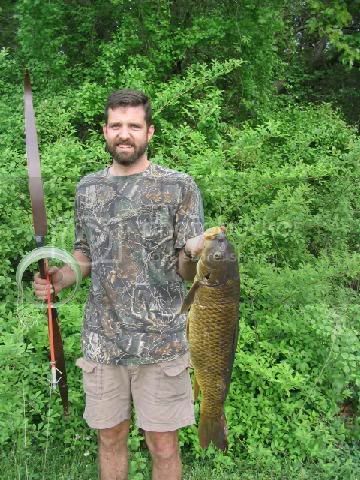 Here is a picture of the first carp of the season. Shot her from the bank of the reservoir out back. 40# Pearson recurve, Muzzy arrow and tip, and homemade reel from an old bucket taped to the riser with electrical tape. Wildlife represents the difference between rich country and mere land. Nice shot--right through the gill plate. I read your article this month in TBM. Good Stuff!